Take a look at this simple but compelling halftone design from one of the creative minds at CheckAdvantage! Its visual interest comes from the intersection of positive and negative; the left half is printed in reverse, with white dots emerging from the field of green, while the right side is printed in the positive -- green on white. This is a terrific choice if you prefer checks with contemporary styling but don't much care for cutesy graphics. You'll also love the ease with which our side-tear checks separate from the pad. 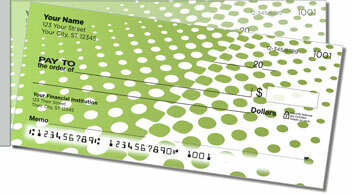 Your checks won't rip in the wrong place, thanks to improved leverage afforded by the short line of perforation on the left. This style is also available in three other colors: orange, blue and purple. Of course, you can also get our multi-color option if you want all four. Either way, don't delay -- make them yours right away!